When relocating to the Capricorn Region, contact Capricorn Enterprise about key facilities, services and experiences and our range of services to ease the transition. Our helpful relocation packs provide you with up to date information, lists of key services and attractions and maps. At Capricorn Enterprise we know how important it is to know all about the schools, employment and real estate agencies, childcare and health services, attractions and tours, so let us help make your decision making process a whole lot easier! If you’re considering a move for your career or just wanting to escape the hustle and bustle of metropolitan life, the Rockhampton region boasts all the facilities of a capital city without any of the worries. The region offers a mix of city, urban, suburban, acreage, rural and village living. Diverse lifestyle options are dotted amongst open spaces of rural landscapes in a way that provides a consistently good mix of urban and non-urban living with affordable rents and mortgages. Well known as the Beef Capital of Australia, Rockhampton is situated on Queensland’s largest river, the Fitzroy, 40 kilometres inland from the beautiful Capricorn Coast beaches and just above the Tropic of Capricorn. The City is surrounded by the Berserker Ranges and Mount Archer (607 metres high), posing an impressive backdrop for the vibrant City centre, business districts and residential areas. With a great range of public and independent schools, boarding schools and Queensland’s first dual sector university (CQUniversity), Rockhampton is an educational mecca. Its diversified economy makes it a critical commerce and service city for Central Queensland with government and professional offices, medical expertise including three hospitals and a great range of leisure activities, restaurants, quality shopping, sporting clubs and facilities. If you are thinking about a sea change, the Capricorn Coast is for you. The Capricorn Coast has a series of towns, villages and localities which allow visitors and residents alike to experience many lifestyle opportunities from suburban, acreage, coastal, waterfront, rural to village living. 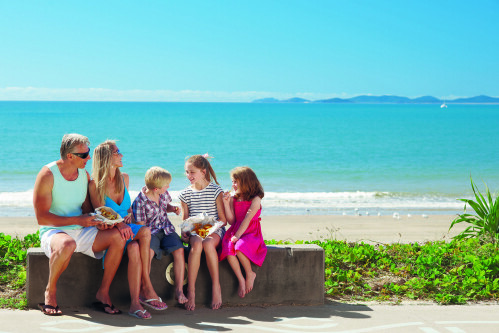 With golden beaches, pristine waters, tranquil rainforests and dramatic sunsets, and a total population greater than 37,000 people, why not take advantage of the spectacular views and idyllic seaside lifestyle and move to the Capricorn Coast? With easy access to the natural environment, the Capricorn Coast offers residents many health and well-being opportunities with fishing, swimming, walking, cycling and sailing possible all year round. The region future is assured with the Gateway Business and Industry Park providing new business relocation opportunities and stunning new residential developments such as The Pines estate, a master planned community, and foreshore living in contemporary units such as Oshen, Echelon and Salt. Come and join us in our piece of paradise today, you’ll be glad you did!